Despite your superlative organisational skills, sooner or later you will forget a key piece of cycling equipment at home – it’s not a matter of ‘if’, but ‘when’. I should know – it’s happened to me on a few occasions already, at both races and group rides (and it’s never a great feeling pitching up at a race sans shoes). Thankfully, there is a solution; and a pretty nifty one at that – it’s called the BLS VeloRacing Bag. 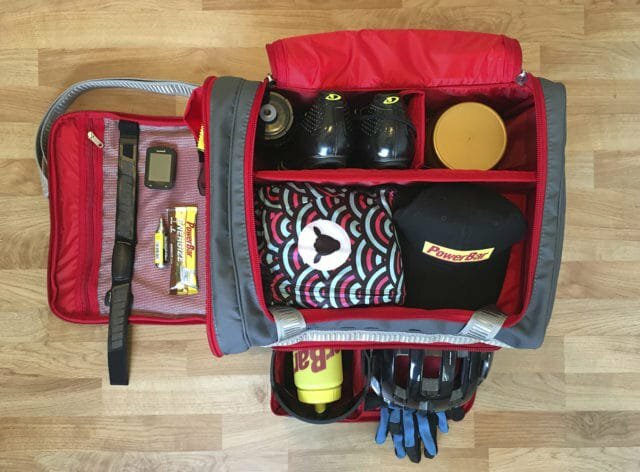 Designed and developed by the innovative chaps at Black Line Sprinting (BLS), the Velo Bag is equipped to house all your cycling accessories bar the bike (though we wouldn’t be surprised if there’s a bike bag in the pipeline too). Available in two guises, namely the Velo and the Exclusive, both bags provide exceptional storage space, with manipulable compartments to fit your specific requirements. Pictured here is the Exclusive version, distinguishable by its grey fabric shell and complementary red accents. The grey colourway, while premium in appearance, is appreciably resistant to showing up scuffs and dirt, which is a boon for riders who enjoy the dirty side of cycling (such as mountain biking or gravel grinding). The bag structure itself is pretty robust, and will go a long way towards protecting its contents from transport damage – no more helmets and shoes flying around the car. The bag’s interior dimensions belie its appearance. Unzip it, and you’ll see just how capacious it is – and organisable, by way of manipulating the Velcro partitions. 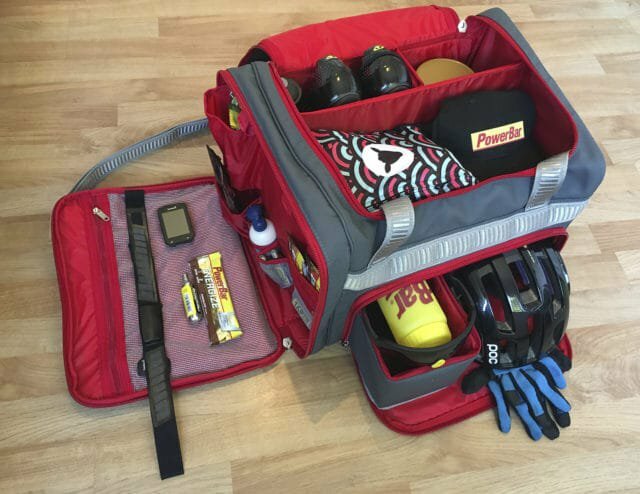 It’s divided into two levels: the upper deck takes care of your cycling kit, shoes and nutrition/bottle needs, while the bottom level houses your helmet, gloves and other items (such as sunglasses or chamois cream) in a neat little storage box. The Exclusive model differentiates itself from its lesser sibling not just in terms of its slightly bigger dimensions, but also by way of a bonus feature – a side compartment for extra storage convenience. Paraphernalia such as extra tubes, bombs and pumps can be stored in dedicated pockets with zips, keeping smaller goodies from rolling around and potentially damaging other items inside the main bag. Also included are two water-resistant bags for dirty clothes or shoes, and a pair of BLS-branded 750ml water bottles. Neat! The BLS (Exclusive) VeloRacing Bag is a specialist piece, designed by cyclists for cyclists, no matter what your particular discipline. With its myriad storage solutions, it will serve every cyclist and his or her particular needs. Its fairly compact dimensions mean it doesn’t take up as much space as some of those complimentary bags you get at stage races (remember it can be used 365 to store helmets and shoes, not just for races). At R2800 (Exclusive) or R1399 (regular), it’s not a matter of ‘considering’, but rather ‘getting’ – especially for those serious about their cycling. And their OCD. Visit www.blsglobal.net for more information.